Although there exists a large body of work on the effects of solvents on oil paint films, more work is necessary. 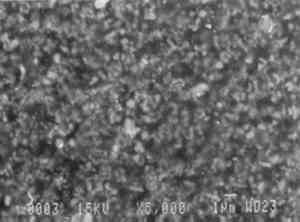 However, there is even less information available on the effects of aqueous cleaning systems on oil films. Some work on the mechanisms of the action of these systems has been conducted. Dry unpigmented oil films will slowly swell and turn white in water. The rate of swelling is slowed considerably when pigments can bond with the oil medium. According to Michalski, water can affect an oil paint film through interaction with inorganic pigments and by forming a film around the pigment particles (Michalski 1990). Water can act as an acid or a base or simply as a solvent in this interaction. The breakdown of the pigment-oil bond can increase the porosity of the film and result in a loss of color saturation. For example, zinc white can be leached out of an oil matrix by water. Figure 5 shows scanning electron micrographs of the surface of a 13-year-old zinc-white pigmented oil film before and after immersion in water for 6 hours. 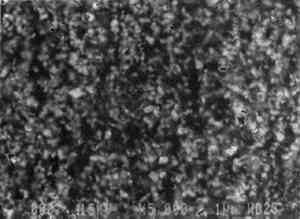 The micrograph of the paint film after extraction shows disruption of the paint surface and the presence of micro-voids. Such voids have not appeared in any of the films that we have treated with organic solvents. Water immersion has also caused blanching and loss of weight in the films. Hedley and co-workers examined some of the effects of water on lead white and raw sienna films (Hedley et al. 1990). They reported that water tends to soften paint films while organic solvents tend to stiffen them. This softening in water could be due either to the loss of the solid pigment or to the disruption of the oil-pigment bond resulting in freer movement of the organic matrix around the pigment particles. One class of aqueous cleaning system in current use in the treatment of paintings includes gelled soap formulations. Richard Wolbers, who pioneered the use of these systems, has used them to approach the problem of the removal of varnish from the aqueous end of the solvent spectrum. Some considerations would suggest that aged and oxidized terpenoid varnishes should be more soluble in more polar solvents and that mixtures containing soaps formed from resin acids would be especially effective in the removal of resin varnishes. Several papers presented at the 1990 Brussels conference of the International Institute for Conservation of Historic and Artistic Works examined the use of aqueous cleaning systems for the cleaning of paintings. Wolbers (1990) used radioisotopically labeled acids to form soaps and then quantified the residues left when these soaps were applied to paint films. The amounts of residues were found to depend on factors such as pH, soap concentration, and counterion. However, significant amounts of material were found to be left behind with all three detergents studied: deoxycholates, abietates, and palmitates. Burnstock and White (1990) also reported problems with the clearance of soap formulations. They concluded that gelled soap formulations should be tailored to act only on the uppermost layer and that careful attention should be paid to the clearance of the soap. They also recommended against the use of Triton X-100 as a gel component, citing evidence of oxidation of the soap components during its use. Recent investigations by the authors have also included gelled and soap systems. The initial data indicate that these systems remove components of the paint film just as solvents do. It is not surprising that formulations intended to remove varnishes and overpaint would also act on original paint layers. In fact, Koller (1990) reported evidence that soaps based on deoxycholic acid may solubilize oil components in preference to resins. A gel soap solution of triethanolammonium abietate was prepared according to the recipe suggested by Wolbers (Wolbers et al. 1990). The only change was the elimination of surfactants such as Triton X-100 following the recommendations of Burnstock and White. This mixture was applied to samples of 13-year-old raw sienna pigmented linseed oil films. The gel was cleared as suggested using cotton swabs and hexane twice, followed by a final rinse of the paint film with hexane. The gel, swabs, and hexane were saved and combined for the analysis of extracted palmitic acid by gas chromatography. Treatment with gelled ethanol also was studied. The results of the analyses of the extracts from several different treatments are listed in table 1. As in previous work (Erhardt and Tsang 1990), the amount of free palmitic acid extracted from the paint film is used to evaluate the detergent effect of the formulation in removing material from the paint film. As can be seen in the data for gelled and ungelled ethanol, gelling reduces only slightly the amount of palmitic acid extracted in a period of six hours. It can also be seen in the data for the abietate soap solution that reducing the exposure time for the abietate soap from 6 hours to 15 minutes also reduces only slightly the amount of palmitic acid extracted. The values for 6-hour treatments with hexane, toluene, and acetone also are included. These results put the soap values in perspective and indicate that the soap removes about the same amount of palmitic acid as hexane and less than more polar solvents such as toluene, acetone, and ethanol. More work is necessary, but these initial results indicate that gels and resin soaps are much like solvents in their ability to leach materials from oil films. Gelling seems to reduce the total amount extracted by ethanol only slightly. In addition, much of the removal of material by a triethanolammonium abietate solution is complete within 15 minutes.